Yeti Cooler Raffle: Limited Edition Tundra Seafoam Cooler! Limited Quantity Yeti Cooler color. The YETI Tundra 45 is the best all-purpose cooler because of its versatile 26-can capacity and easy portability. 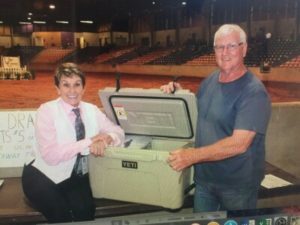 This cooler is infused with that legendary YETI toughness — made from roto-molded polyethylene, it’s UV resistant, heavily insulated and near indestructible. The durable, marine-grade nylon rope handles with textured grips let you easily haul your Tundra 45 camping cooler on short trips and quick hunting excursions.It’s also great for a day on the lake due to its molded-in tie-down slots and non-slip feet, and will even stand in as a casting platform if you decide to throw a line in the water. Nomination will also be taking from the floor during the annual meeting on Dec 9, 2017. Scholarship Applications Due June 10th! Scholarship applications will be due by June 10, 2017 to be considered for scholarship this year. We are raffling a 45-quart YETI cooler at UCWHA High Pont Show on May 13th! Saturday May 13, 2017 at Hyder-Burks in Cookeville, TN. I agree to be a (circle one) GOLD or SILVER or BRONZE or FRIEND sponsor for the 44th Annual Upper Cumberland Walking Horse Show. Net proceeds from this Horse Show help the Upper Cumberland Walking Horse Association provide scholarships for higher education, sponsorships for youth projects and donations to various other worthy programs that promote youth and the Tennessee Walking Horse. Officers will be elected during the December membership meeting and award banquet, floor will be opened for nominees. See by-laws for requirements to be eligible to hold office. Please review the 2016 High Point Awards list and try to attend banquet on Dec 10, 2016 to accept awards. 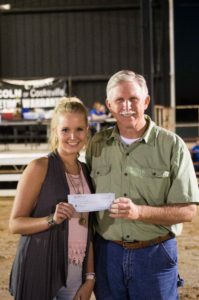 UCWHA President Jimmy Sherrell presents scholarship check for $500.00 to Alexis Clark. 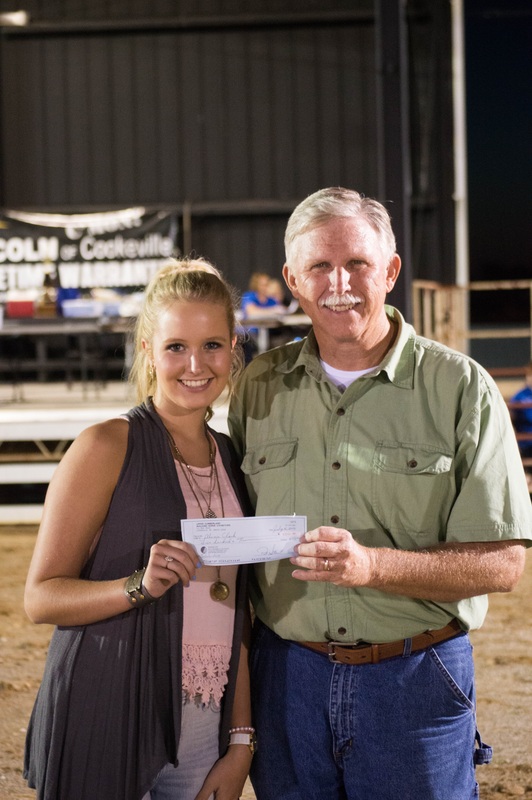 Upper Cumberland Walking Horse Association has offered scholarships to youth members for several years, we are proud to announce the recipient for the 2016 Scholarship is Alexis Clark of Baxter, TN. Alexis is the daughter of Travis & Dusty Clark of Baxter and a 2016 graduate from Upperman High School in Baxter, her Honors include National Honors Society, Tennessee Scholars & Academic Excellence, Top 10% Honors, Beta Club, Vital and FFA. She has enrolled at Tennessee Technology University in Cookeville, TN. to start this fall. She has been a UCWHA member since age of 6 and won several High Point Awards and Youth Sportsmanship Award. UCWHA makes a donation to Dekalb County FFA. During the recent Upper Cumberland Walking Horse Association Annual Horse Show, Dekalb County FFA helped with admission, collections and arena gates. To show our appreciation UCWHA is making a donation to Dekalb County FFA. The members of the Dekalb County FFA did an excellent job, without their help we would not have enough manpower to host the show and we always enjoy having them at our shows. It also introduces their members to the Tennessee Walking Horse and the process to show a horse. 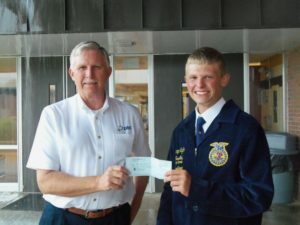 Pictured below is UCWHA President Jimmy Sherrell presenting a check to Dekalb County FFA President Casey Taylor.